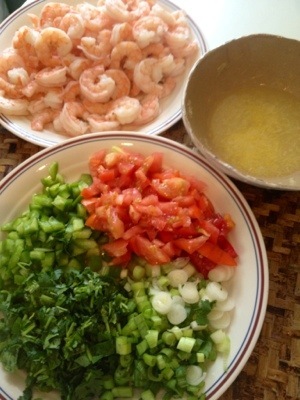 I really adore eating ceviche so I decided I would try to make some. Ceviche is a dish that originated in south America, traditionally using raw fish. The addition of lemon or lime juice would serve to kind of cook the fish. I just cannot bring myself to use raw fish in a recipe, so I got some raw shrimp, cleaned, deveined, head and tails removed. I boiled them for a few minutes with a little seasoned salt, drained them and added the other ingredients. It is chilling in my fridge now and will be ready for a cool dinner on a hot summer night. Combine all ingredients allow to chill for a couple of hours. It’s good to serve with tortilla chips. 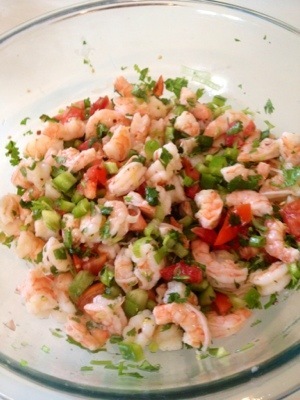 This entry was posted in appetizer, low carb, main dish, salad, side dish and tagged appetizer, Low-carbohydrate diet, Salad, shrimp.ceviche., side dish. Bookmark the permalink.